I am happy to report that the remediation of the mold issue in the basement is complete! The pretty part has begun. 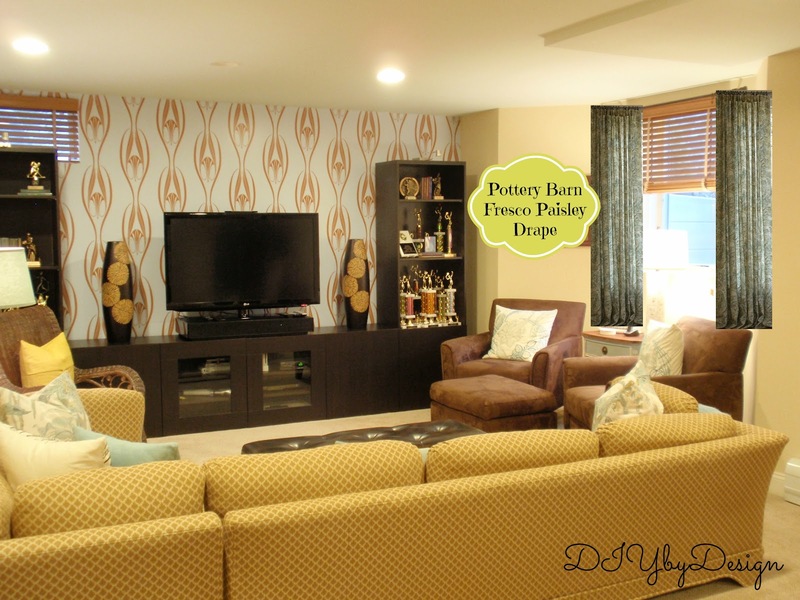 The walls and ceiling are painted a different color than before, giving the room a lighter and brighter feeling. We also replaced all of the overhead lighting with brighter LED lights. I will do a post about that soon. It makes a HUGE difference. Here is a different view of the room. We changed up a few things. For starters we moved the Ikea Expedit from behind the couch. There was just way too much going on visually before. This gives the room a much lighter look. We also spread out the trophies. Before the media unit was filled with all of my kids trophies. and added some books for a little interest. The rest of the trophies got moved to the Expedit unit. Notice anything missing from the window? Remember the drapes that I had to have dry cleaned because of the remediation? Remember how they shrunk 7" at the dry cleaner and the dry cleaner said that he has been in business for 25 years and nothing like this has ever happened before? Remember how the dry cleaner kept swearing that he dry cleaned the drapes even though I continually asked if he had washed them? You can click here for that full story. By day three the dry cleaner's wife said she would iron the drapes to try and stretch them. When I got them home after the dry cleaner stretched them, they looked like an old worn out t-shirt...really like a rag. It was at that point that the dry cleaner finally admitted that they had washed the drapes. 100% linen...and they washed them. Seriously??? They reimbursed me for the cost of the fabric and the cost of the dry cleaning. However, before I go and order the same fabric, I figure I should use this as an opportunity to see if I can do something a bit better. 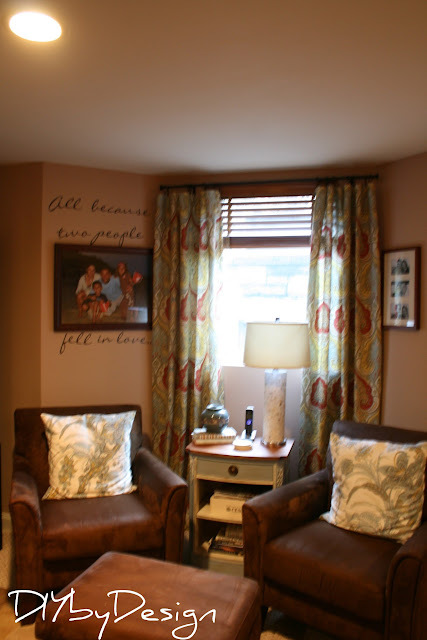 I always loved those drapes, but maybe they were a bit too bold and competed with the focal wall. So, thanks to PicMonkey, I am trying out some other options. The first option is a ready made drape. They actually cost less that the cost of new fabric and will save me plenty of time. They are also made of linen so they have that great texture. They are are much more subtle than the previous drapes. If I decide to make drapes, my fabric options are endless. I love the idea of an Ikat pattern. This one seems to have all of the colors I have in the room, but hard to tell. I also found some other Ikat options that may work as well. 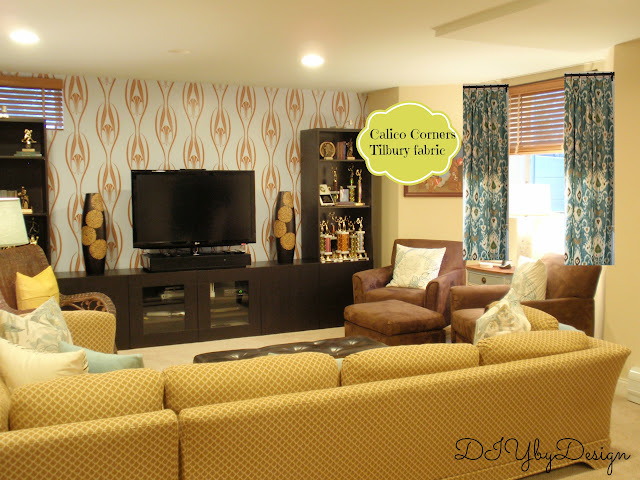 I'm probably going to stop by Calico Corners today and order some swatches before making any final decisions. 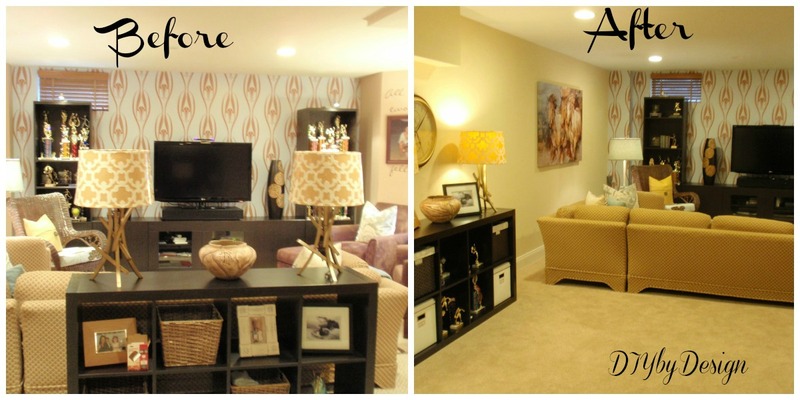 So what do you think of the newly renovated basement so far? Know of any great Ikat patterns I should be considering? Make sure you stop back tomorrow when I will revealing my craft/sewing closet. It's pretty awesome! Home is Where the Heart is shared the gorgeous headboard her husband made her for Christmas. 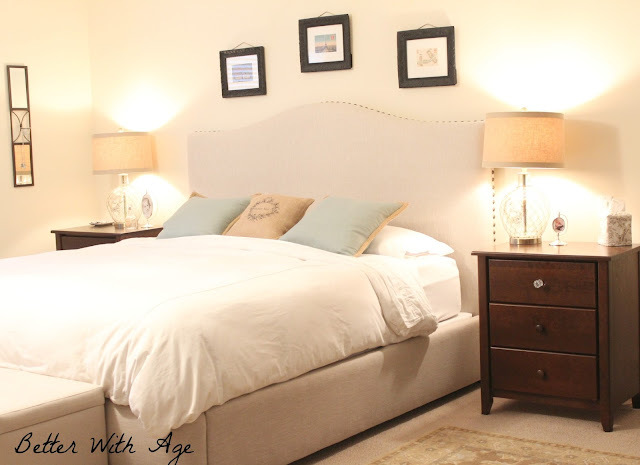 Better With Age shared her master bedroom makeover. I love the new bed with the nail-head trim. 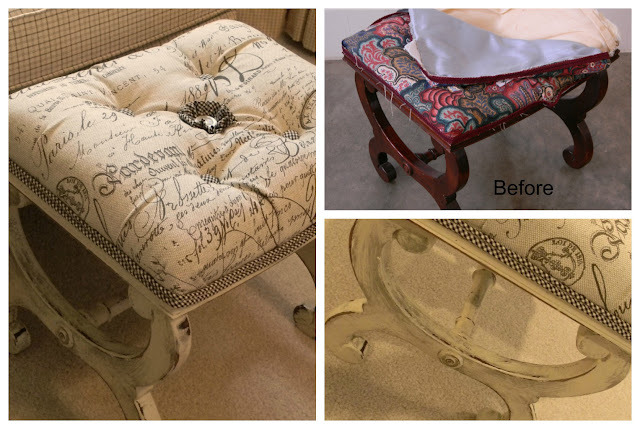 Forever Decorating transformed an old stool into this tufted beauty. What a gorgeous bench now! 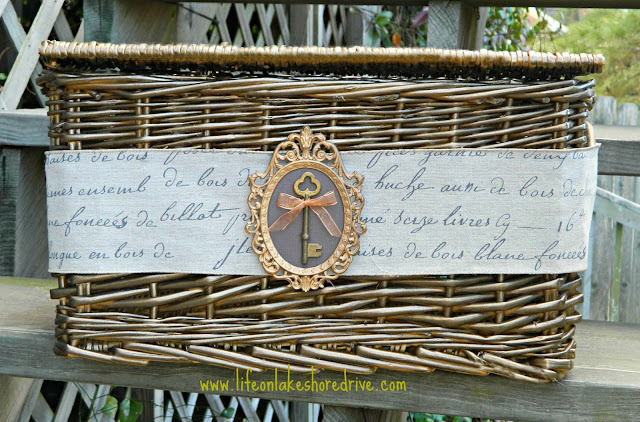 Life on Lake Shore Drive transformed a basic wicker basket and turned it into this beauty. My friend Vanessa, over at At The Picket Fence created this beautiful doll house for her daughter's American Girl dolls. 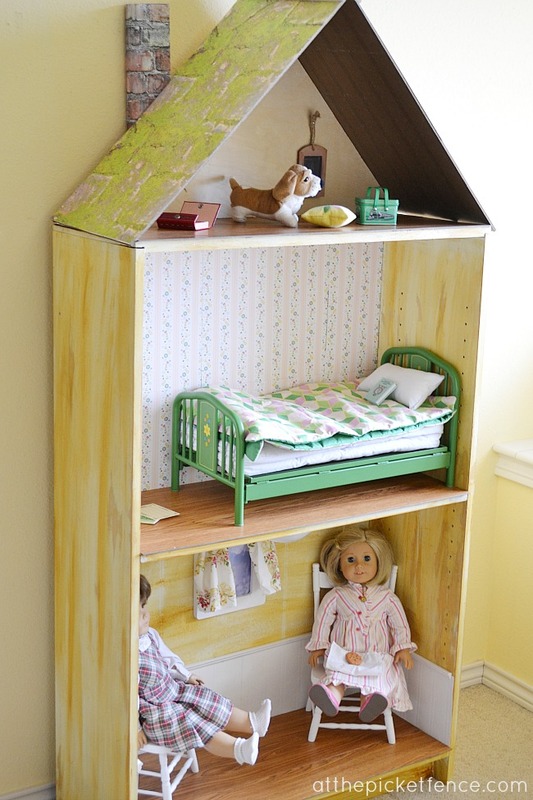 She started with a basic bookcase to create this ultra-cool doll house. Be sure to stop by for the full tutorial. Remarkable Home shared her recipe for frozen bananas. 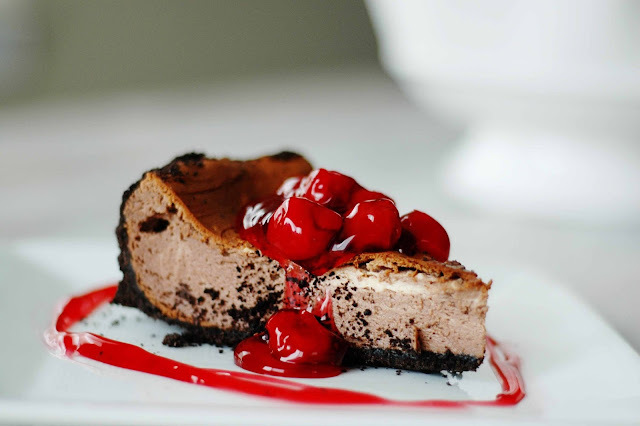 Yum...those look so good. Carissa Miss shared her recipe for chocolate cherry cheesecake. For Valentine's Day my husband surprised me with an Ethan Allen end table. It's a beautiful table and deserves a beautiful lamp. So, since then, I have been keeping my eyes open for something special. On Sunday I did a quick walk-through of my favorite store, Home Goods. It was a zoo on Sunday and I was sure I wouldn't find anything which would happily allow me to avoid the long lines. I headed to the back of the store, and at the end of the lamp aisle, on the bottom shelf, I spotted this lamp. Immediately the gorgeous color and finish caught my eye. The next thing that caught my eye was that it was from Ralph Lauren Home. I picked it up and it was heavy and in pristine condition. It also had a gorgeous pleated silk shade. I could see and feel just how much of a quality lamp this was. Home Goods was selling the lamp for $119, which is expensive, however the tag said that it retailed for over $300 at Ralph Lauren Home! Okay...this lamp had to come home with me. When I got home I did a little research on the lamp. It's called the Alston table lamp by Ralph Lauren and sure enough it did retail for over $300 when it was being sold by Ralph Lauren ($330 to be exact). It is the perfect size lamp for this table. It also balances off this side of the room. I am so in love with my new lamp. Don't forget to stop back tonight for my Winter Blues Wednesday party. I spent the weekend working on my craft closet. It's taking a while to go through all of the closets where I have stuff stashed and organize it all in my new space. Hopefully I will be sharing it with you in the next few days. I needed a chair for the space, so I went up in the attic and brought down a chair which has gone through many makeovers in the past. Here is it's latest transformation. This chair was in my daughter's room a few years ago. I probably could have left it white with the pink fabric, but I really wanted something more fun for my new craft space. When I saw this awesome fabric, I was inspired to spray the chair turquoise. Unfortunately it's still cold here, but patience is not one of my virtues, so I went outside and spray painted it quickly. Then I carefully brought it inside to dry. I figured even though it was under 40 degrees outside, it was warm inside and hopefully it would all work out. Here's some tips when covering a chair seat. First, if you are using a large scale pattern like I have, be sure to decide which part of the pattern you would like for your seat. In my case I decided to focus on the paisley section with the flower in the center. I start on one side and then work my way to the corners. I fold the corners into thirds and staple as I go. After I finish off the bottom I cut off the excess fabric. This chair is going to look so good in my new craft closet. Here's a reminder of what the craft closet looks like so far. Can't wait to share the finished closet! What do you think of my fun, funky turquoise chair? I have been busy, busy, busy putting our basement back together after the remediation and getting my craft closet all together (we think we're going to start calling it the lower level as it looks so beautiful now). As you know, we discovered mold in our basement and had to have the entire basement remediated. As part of the remediation, we had to have our drapes dry-cleaned. I brought the drapes to our dry cleaner. As you can see in the photo above, the drapes just kissed the floor (and I had a 5" hem which I kept that long just in case we ever changed the flooring...who knew it would be so soon). After dry cleaning, the drapes do not come close to the floor even with the hem taken away (that's a raw edge you see). Somehow the drapes shrunk 5-10 inches (the two sides did not evenly shrink and one side is worse than the other, but both sides are floods now). The drapes are 100% linen, but they were dry cleaned...not washed. Why would they shrink? The dry cleaner does not want to take responsibility so I am going there this morning to try and work this out. As for the craft closet, it is really coming together. I have been creating storage boxes using pretty liner paper and shoe boxes (my kids go through sneakers like crazy so we have tons of shoe boxes in our house). I also created more storage containers using these. It's just a tease, but hopefully by early next week I will have the full reveal. Anyone have any idea why my drapes would shrink so badly?